Shop FamilyLife - Say It Loud! Say It Loud! is cheerleading preparation for every married woman who desires that her family wins. Life will try to hand you defeat, anguish, and disappointment, but just as a cheerleader cheers for her team through the great, hard, and difficult games, so you are the head cheerleader for your family team. Say It Loud! will inspire you to be the ultimate advocate for your family, beginning with the encouragement of the man who has been called by God to lead your family. Your husband may not lead your family perfectly, but you will learn that he doesn't have to be perfect for you to be his personal cheerleader and continually root him on to victory. Everyone desires to be on the team that wins. This book will encourage you and show you how to be a cheering wife who will Say It Loud! "We've been told we can do it all as women, but you and I know something has to suffer; many times it's our husbands. 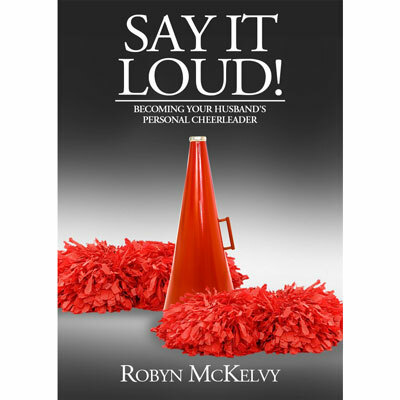 In Say it Loud!, Robyn reminds us that on our wedding day, we promised to love, honor and cherish our men. He still needs you to be his biggest fan. Robyn understands the value of being her husband and her children's cheerleader in life. Let her encourage you to say it LOUD!" - Barbara Rainey, wife of Dennis, mom of six and grandmother of nineteen. And in these empty nest years, author, artist and creator of Ever Thine Home® products for women. "Okay, an endorsement from the author's husband might seem a little self-promoting but who better than I, having been the recipient of over 25 years of encouragement I can say she lives it. In this book you will receive the 'coaching' from one of the best cheerleaders I know, my wife, Robyn. So read it and say it LOUD!" Robyn McKelvy is a woman, mother, sister and friend. She is married to Ray McKelvy and they have served together in ministry the past 23 years. The McKelvy’s travel internationally and nationally speaking on marriage and family.